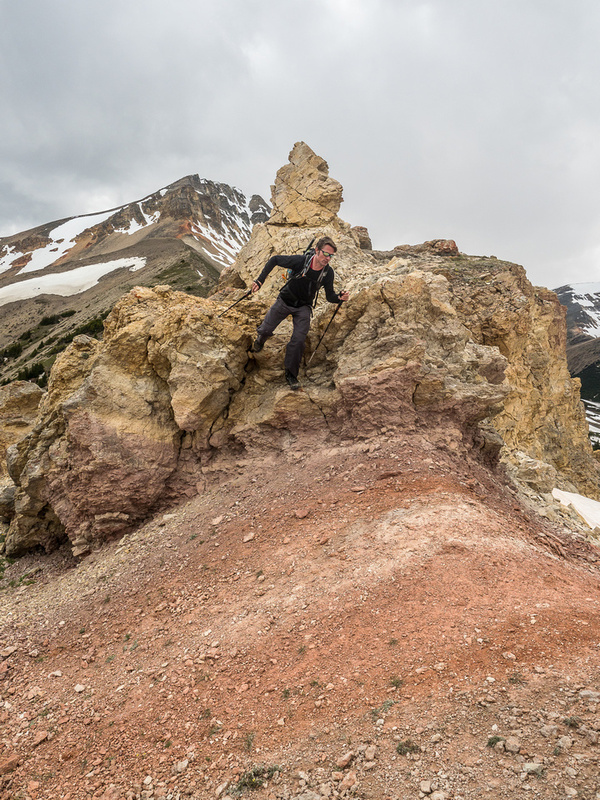 Difficulty Notes: No difficulties to the summit of Tuff Puff. Whirly Puff is mostly an off-trail hike if you avoid our ill-advised attempts to Whirlpool. Note: We did an exploratory trip well beyond Tuff Puff to see if we could forge a route up the NE face of Whirlpool Ridge. We couldn’t and we didn’t. 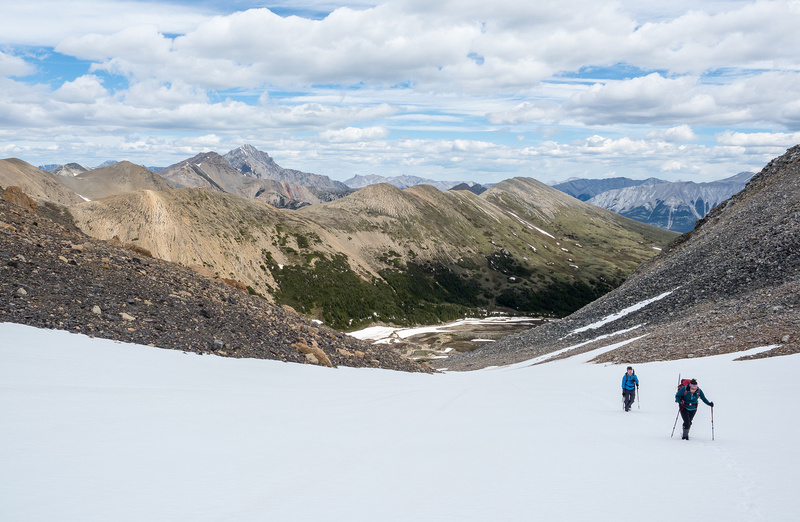 While on our 15 hour, 2600m+ vertical day traversing from Mount Ernest Ross to Two O’Clock Ridge with Mike Mitchell, there were two other peaks dominating the landscape for most of the day. 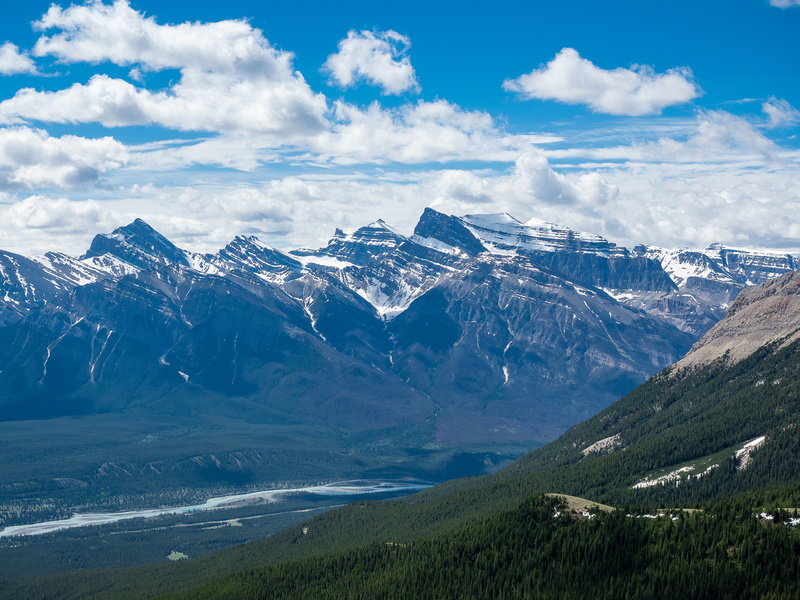 The first was Elliot Peak to the north, the second was Whirlpool Ridge to the south. 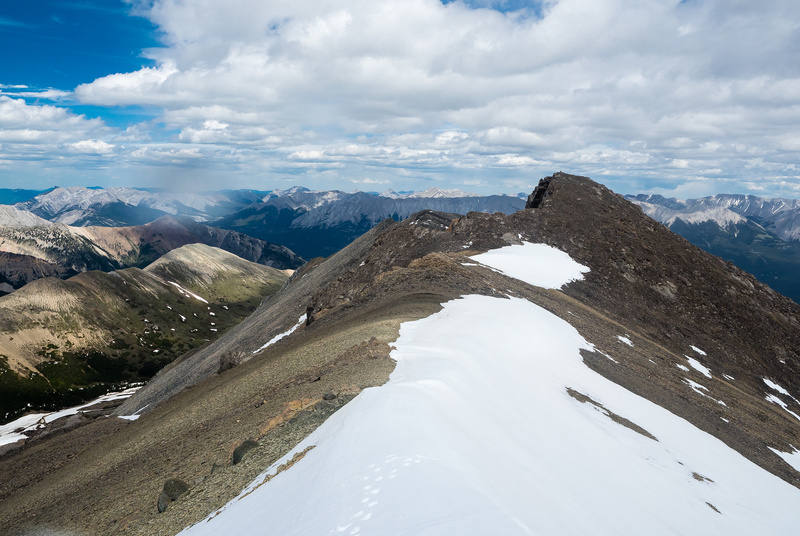 Especially from Two O’Clock Peak and onwards to the ridge, I kept looking back at Whirlpool’s north bowl which looked to have a very esthetic line going up snow gullies and chimneys to its summit. The more I looked over at it, the more I liked the idea of trying it. The catch was access. Two O’Clock Creek looked fairly choked up lower down and didn’t appeal to me. As Mike pointed out the ridiculously named and placed “Tuff Puff”, I got my answer to the access for the north bowl of Whirlpool. 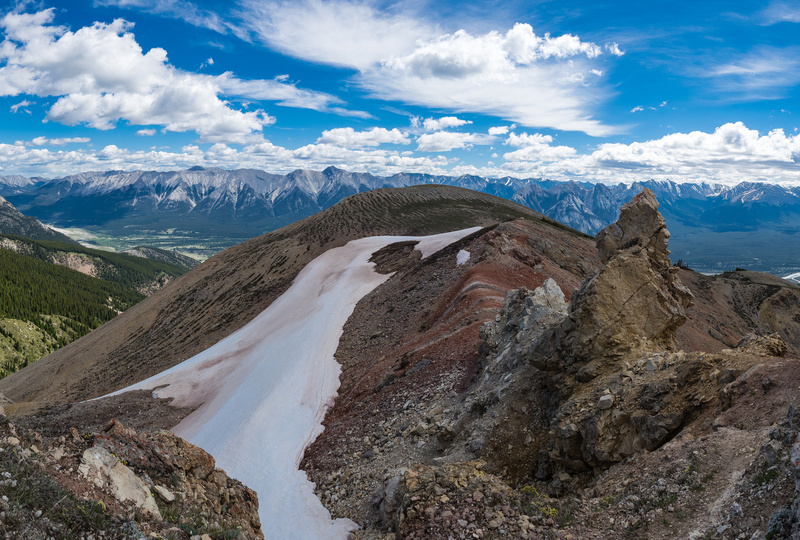 Why not ascend the easy hiking trail to Tuff Puff and then traverse around the north aspect of Whirlpool before ascending the obvious north bowl drainage? Sure! There was some side-hilling involved but with enough snow, the slope looked pretty darn straightforward and easy. DTC is a long drive from my house at around 3.5 hours, so I decided that since work was slow, I might as well spend a few days there instead of just one. I drove myself and met the others at the parking area for Tuff Puff / Kinglet Lake. Just as I pulled into the small parking area off hwy 11, I noticed a large black bear crossing the highway nearby! I’ve seen at least 10 bears in the past few weeks – way more than usual for me. It didn’t seem too bothered by my presence, so I didn’t bother with it either and soon it crossed a nearby fence and wandered off down towards the river. Phil drove up soon afterwards and soon we were hiking up the trail to Tuff Puff. We had a discussion at the trailhead about what gear to bring. I brought crampons and ax, while everyone else chose to leave the ‘pons at the cars. 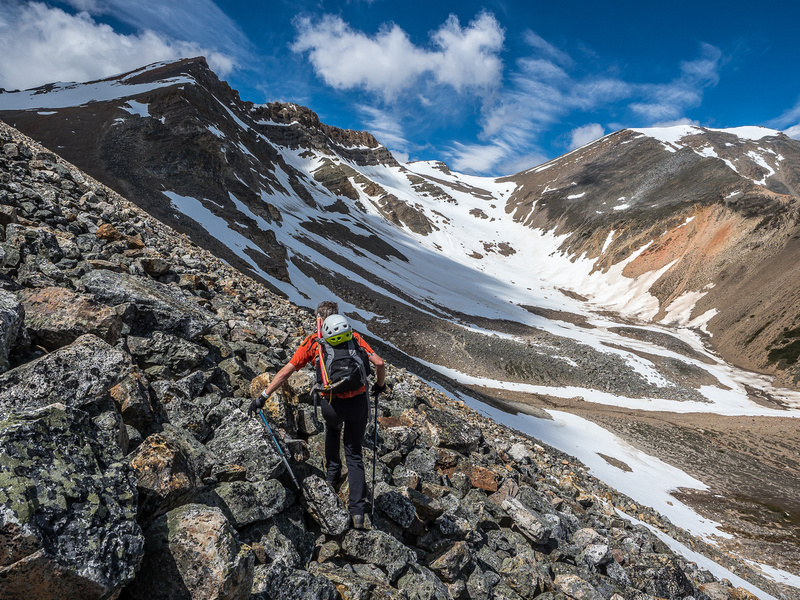 This is why I like aluminum crampons – I’m less likely to leave them behind due to their very light weight. I knew we’d be on snow and figured it might be steeper than expected, given what Mike and I dealt with on our traverse in the area. I also wore my “light” mountaineering boots, which are about 3x heavier than my scrambling shoes and far more uncomfortable. It makes me grumpy to wear those boots – but with the amount of snow and side-hilling I knew we had to deal with, I figured I’d better be smart about it. I was glad for both of my decisions to carry more weight this particular day. Surprisingly nice views and open hiking on Tuff Puff. Whirlpool in the distance at left. The trail was obvious and didn’t waste any time before gaining height. I decided to be very astute and mentioned how “tuff” this “puff” was, at least every 20 minutes or so on ascent. The rest of the group was very appreciative of my creative and witty humor. 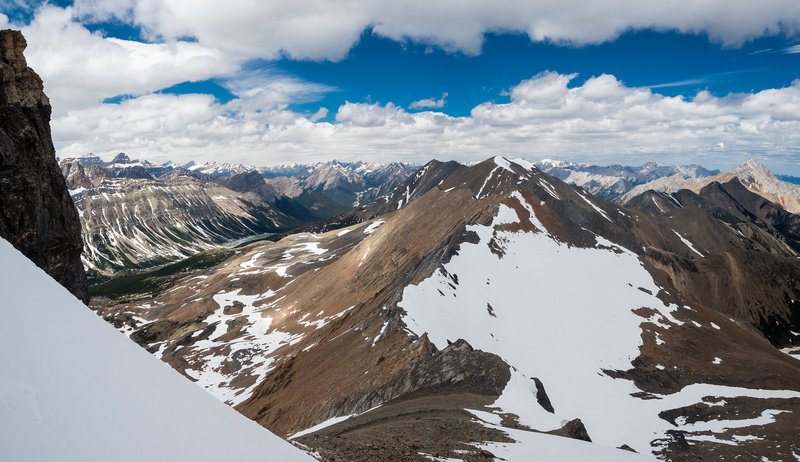 Our views back over the North Saskatchewan River towards the Ex Coelis Group, William Booth, Siffleur and Peskett were stunning as we got higher and higher on the south ridge. Our idea to chase the good weather fx was working out fantastic (we learned later that Waterton was raining all day). 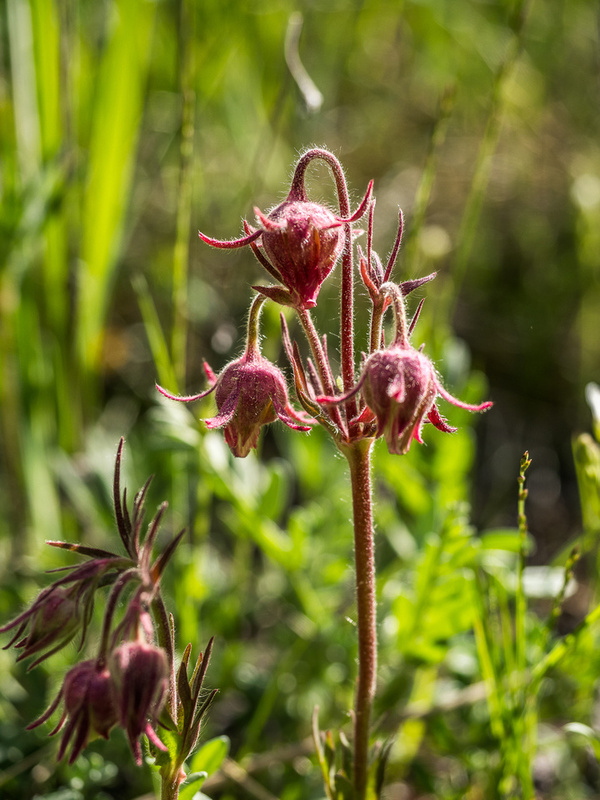 As we worked our way through some open grassy meadows, filled with wildflowers, we heard talking ahead. 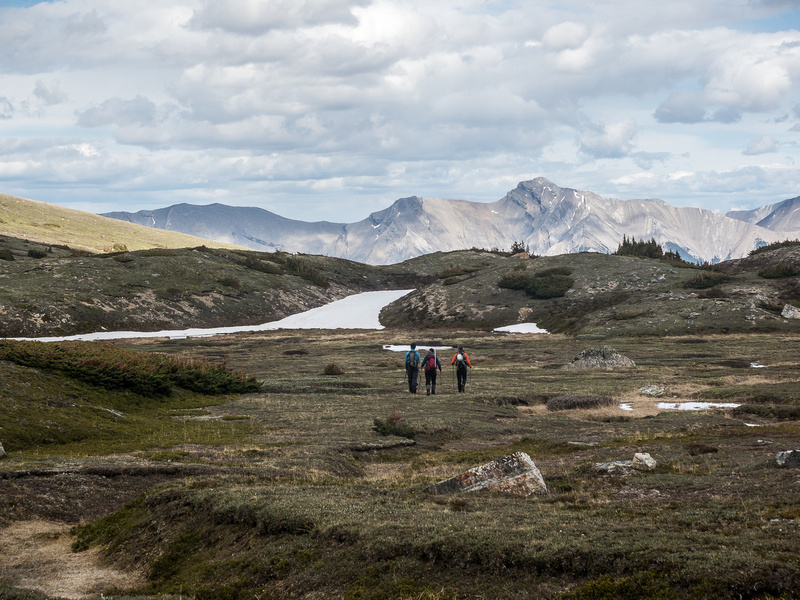 Soon we came up on a large group of students, coming back from an overnight trip to Kinglet Lake. They were waiting for the group leaders to catch up (!) before hiking to Tuff Puff before heading back. 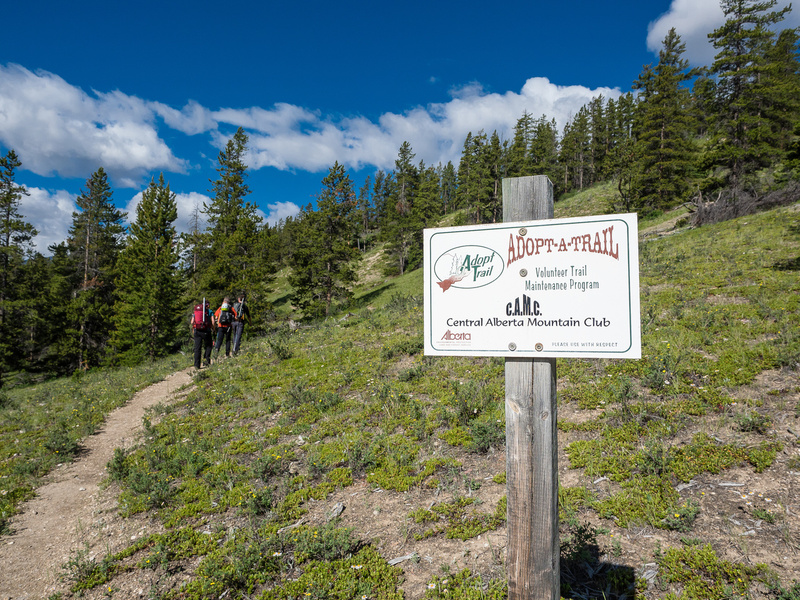 We continued up the trail, passing over a small snow slope before a final, steep (still hiking) ascent to the “summit”, which is really only a shoulder on a ridge leading west towards a high point, which we would eventually call “Whirly Puff”, which is around 500 meters higher than Tuff Puff. 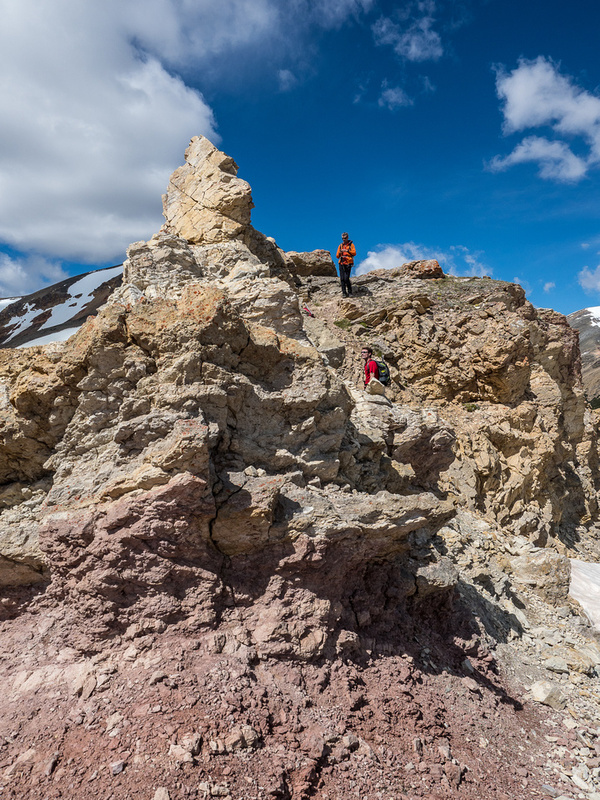 Geoff hikes along the summit plateau on Tuff Puff with great views all around from Elliot and Ernest Ross at left to the Ex Coelis group at center to Siffleur, Peskett and Loudon at right. Wonderful colors as we continue west along the ridge towards Whirlpool. The views from Tuff Puff were much better than I expected, to be honest. Sure, it’s not much of an actual summit, or even a scramble, but it’s still 1000m higher than the trailhead and has the views to prove it! I think if you’re a hiker in DTC you should absolutely check this one out. It took us just over 2 hours to reach the summit, so a 4 hour day is all we’d have if we turned around here. But we didn’t! We had much more adventures ahead yet. This was only supposed to be our approach. A beautiful area for an off-trail hiking adventure! Whirlpool’s south ridge at distance left, Two O’Clock Peak at right. Our access valley to Whirlpool’s north bowl is just visible in the far distance right of center after a long side-hill traverse. Looking back at the others on the ridge. The slope steepens considerably at the back of the bowl near the summit block. This is looking north over Landslide Lake (L), Landslide Peak (C) and Two O’Clock Peak. Elliot at far right. 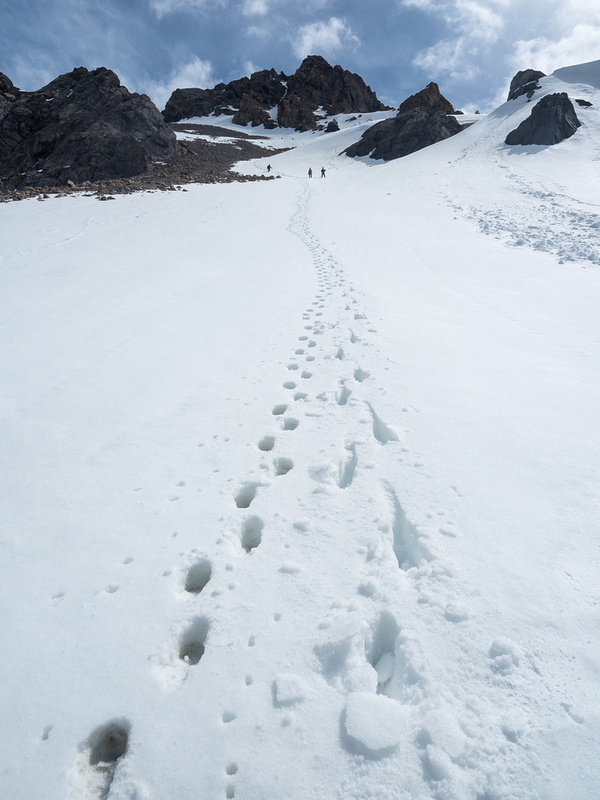 As the terrain steepened considerably, we were left with two options to gain the summit of Whirlpool. We could swing right and attack it directly from the north, or swing a bit left and attack it via a steep snow couloir on the east aspect. We chose the north aspect first, since it looked easier. As usual, once we started up the snow it steepened quickly and soon was fairly close to 40 degrees – even approaching 45 near the top of a short arete before topping out on scree. From here we looked around in a bit of dismay. 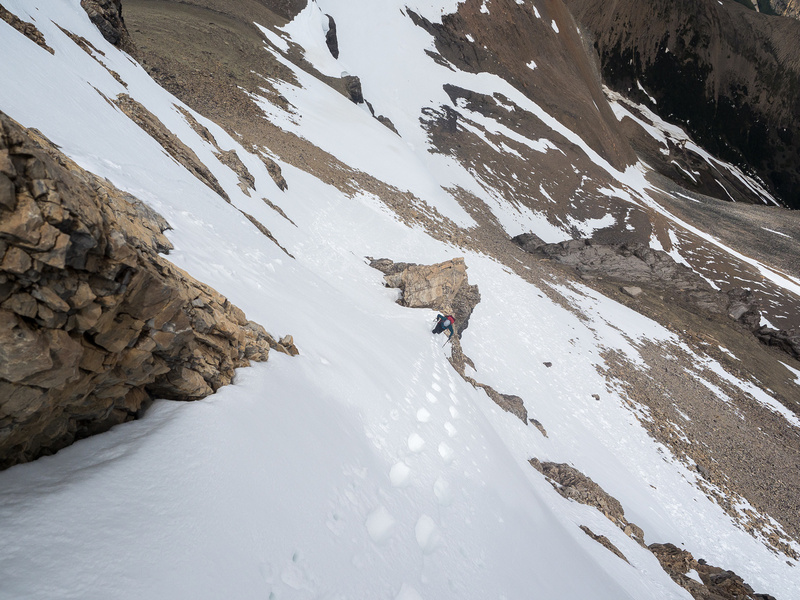 There were cliffs blocking direct access and we had to traverse to the east aspect to see if we’d get lucky with a chimney or couloir to the summit, which was at most 20-30 vertical meters above us. We couldn’t find one. 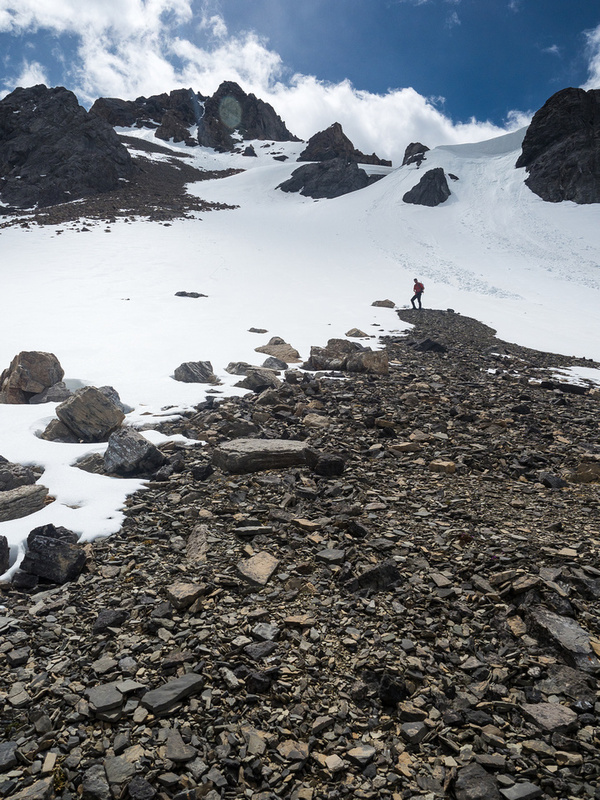 There was one possible candidate, but a combination of exposed snow on ice (which meant only I could even attempt it, with crampons), followed by very exposed and loose rock traverse after that, turned us back from this route. 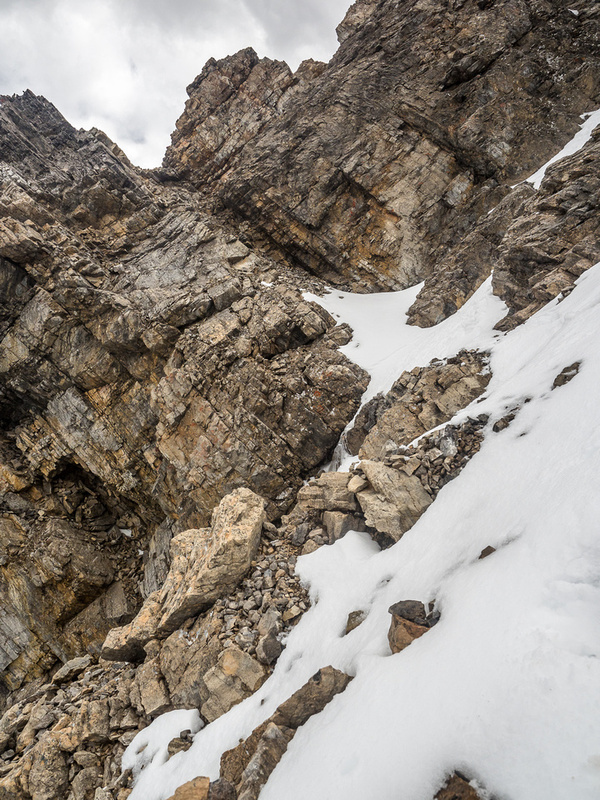 Without snow it would still have been difficult and likely not feasible as a scramble route. Geoff hangs out while we decide how many risks we’re willing to take. 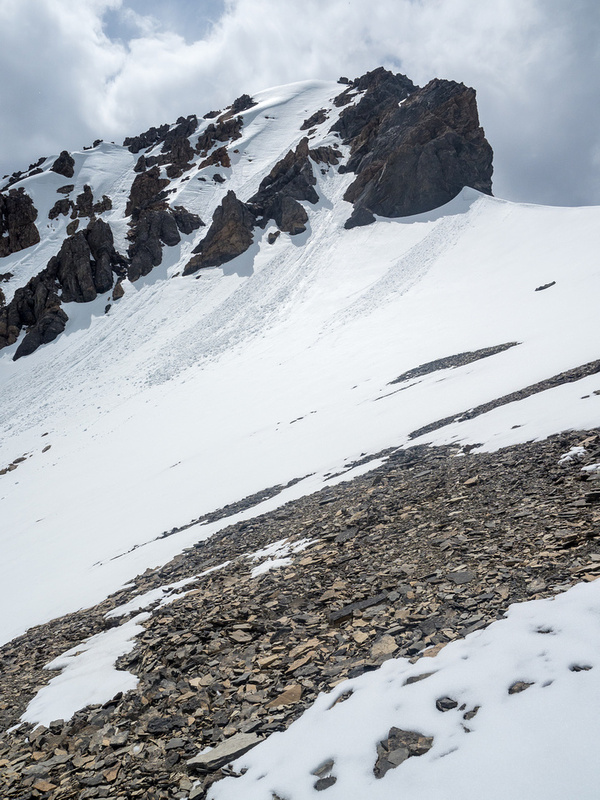 Somewhat dejected, we descended the steep snow arete and started towards the second option for ascent – the steep snow gullies on the east aspect of the summit block. It was at this point that Geoff, who decided to tag a nearby high point while Phil and I checked out the gullies, yelled towards us that there was someone already on the summit of Whirlpool above us! WHAT THE HECK?! You have got to be kidding me!!! While it was cool to realize there must be a feasible route somewhere on the dang thing, it was incredibly frustrating to realize that we obviously weren’t going to find it from our vantage. 🙁 To make a long story shorter, Phil and I gave it an honest effort. 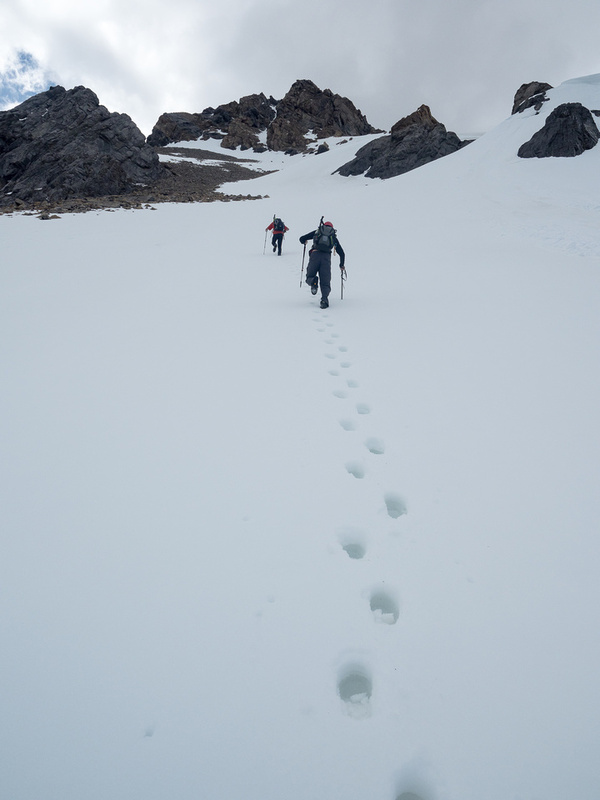 A combination of terrain and bad snow conditions (east and south facing aspects) prevented us from getting to the summit from the east via steep gullies. In the summer these gullies would likely provide access, but would be loose and exposed. There was obviously a better way! While we were checking out options from below, the summit team above us (four of them) were descending the south ridge. Yep. Apparently there was a route up the south ridge after all! We yelled back and forth a bit and confirmed with on of them that it was a “fun scramble”. Double dang it. I was a bit frustrated but we decided that we’d still had a great day out and named our high point, “Whirly Puff” – Geoff’s contribution to the strange names in the area! A view of my peaceful random camp. A view of my peaceful random camp with my next day’s destination in full view at distant left – Whirlpool Ridge. Our descent was uneventful and we discovered the very nice valley between Whirlpool and Two O’Clock Ridge before re-ascending Tuff Puff and hiking back out to our vehicles. 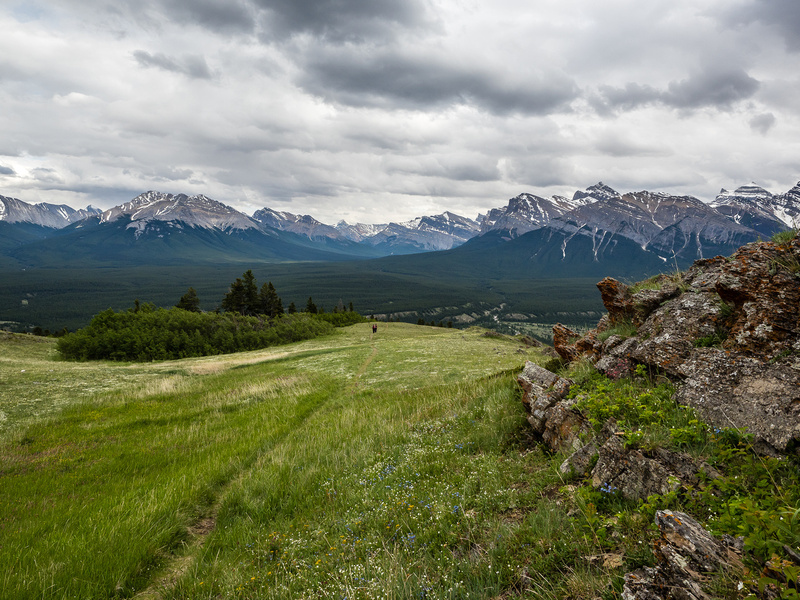 I had already decided that my next day was going to be gaining those 30 vertical meters to the summit of Whirlpool Ridge and drove off to find a campsite for the night, while the others made the long drive back to Canmore and YYC. This was a great day out in the hills, exploring new routes and terrain with friends and as such, it was a raving success despite the plans falling apart a bit towards the end. 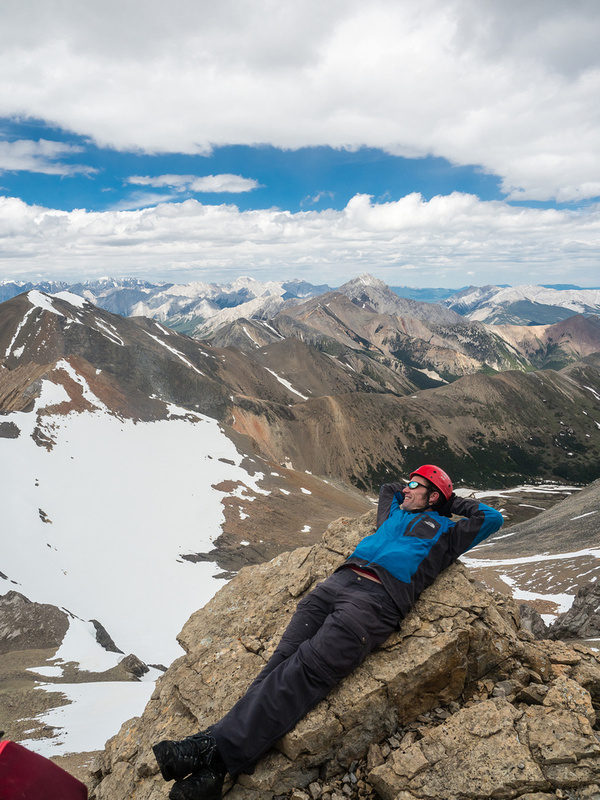 Tuff Puff is certainly worth your attention if you like nice mountain views. 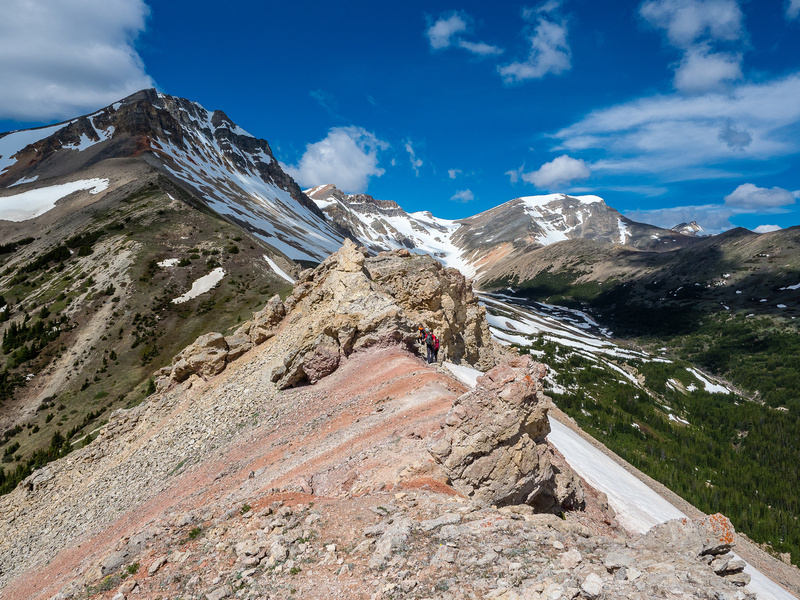 Whirly Puff is much higher with even better views, but it does require quite a bit more effort to attain and is definitely not an official, or even semi-official summit. Does that diminish the views from the top and the lovely terrain you’ll pass through on your way there? Only you can decide that. A gorgeous day as we start our hike. 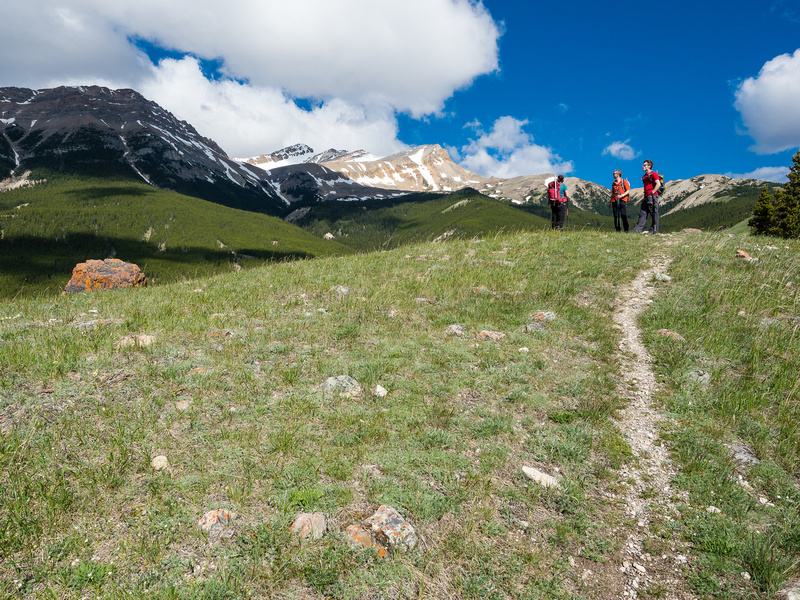 Maintained by the Central Alberta Mountain Club. A gorgeous morning to be out and about. Waiting for Vern to quit taking photos of flowers! 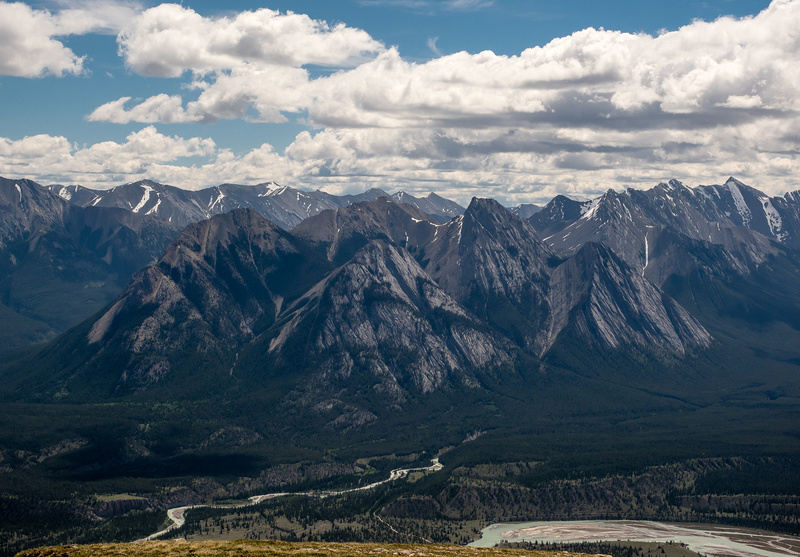 It doesn't take long before you get views like this, looking back over the North Saskatchewan River towards the Siffleur Wilderness Area. 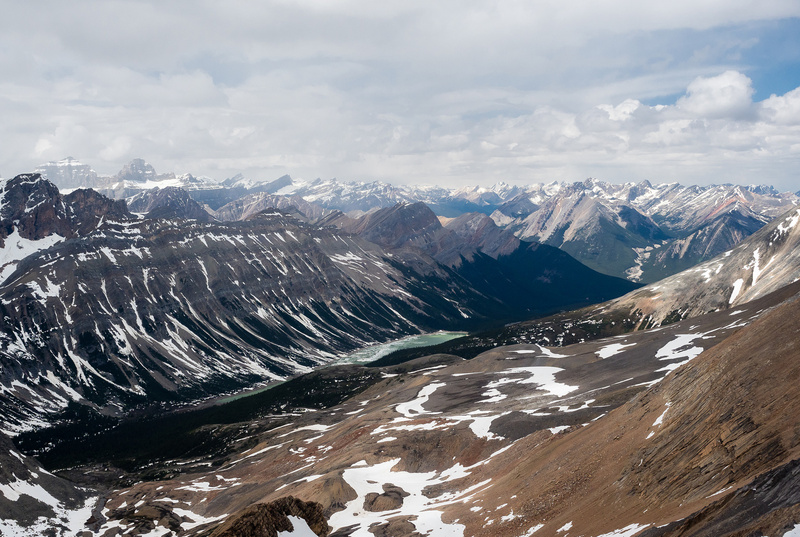 Views over the North Saskatchewan River towards Siffleur, Loudon and Peskett (L to R) - giants in the Siffleur Wilderness. Looking directly south up the Siffleur River towards Cheshire, Erudite and Heinrich. The Ex Coelis group, from L to R, Normandy, Ardennes, Stan Waters, Rhine and Elbe. 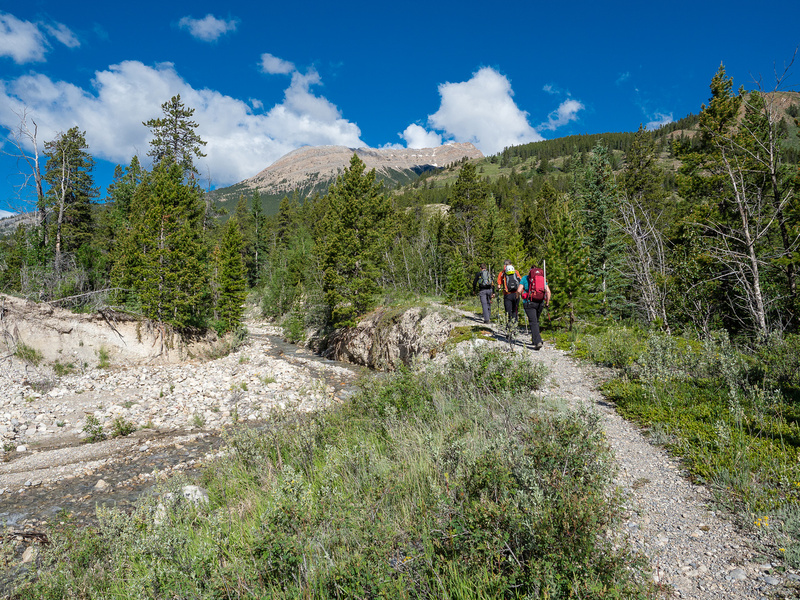 The fun starts as we make our way beyond Tuff Puff towards the headwaters of Two O'Clock Creek. 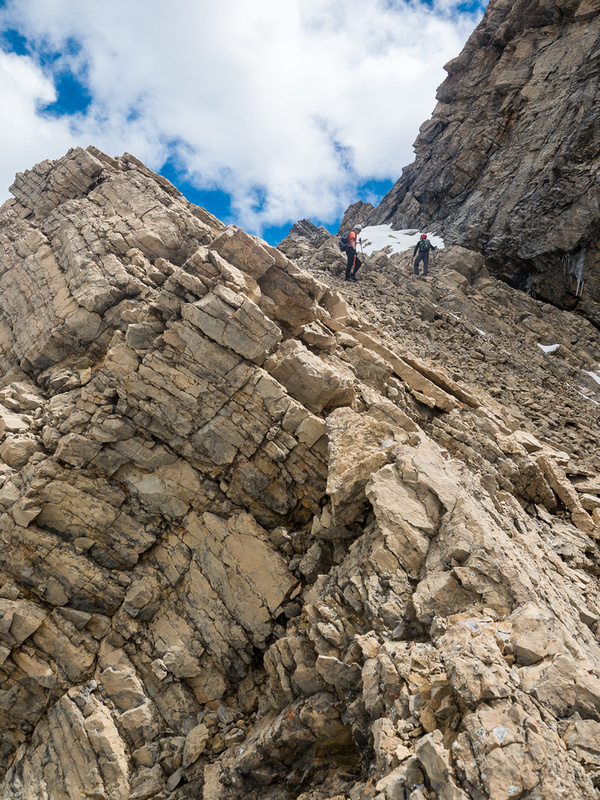 An interesting scrambly bit along the ridge. Looking back over Tuff Puff towards William Booth. A beautiful area for an off-trail hiking adventure! Whirlpool's south ridge at distance left, Two O'Clock Peak at right. 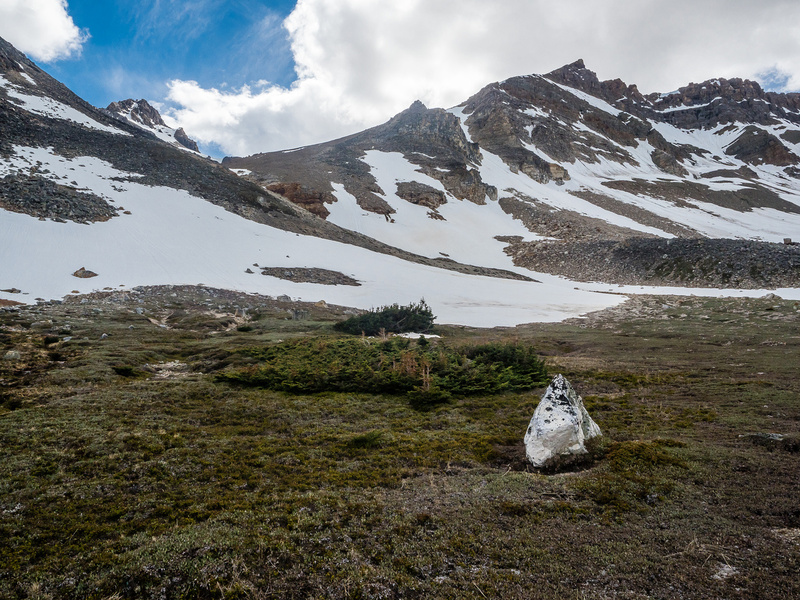 The first snow patch has an 'interesting' runout. 🙂 The snow was soft enough that we kicked steps safely across it. Looking back along another slushy traverse - Tuff Puff barely visible in sunlight at the end of the ridge. Two O'Clock Ridge at left. The team slogs it out with Tuff Puff in the distance. 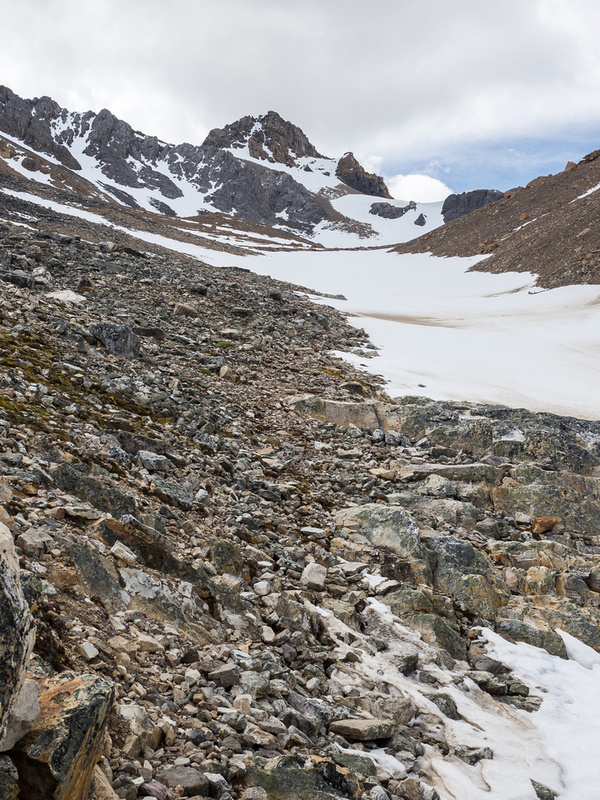 Much more annoying than the snow however, the boulder field made us descend to the valley at left on return. Looking up around 450 vertical meters to the summit of Whirlpool. 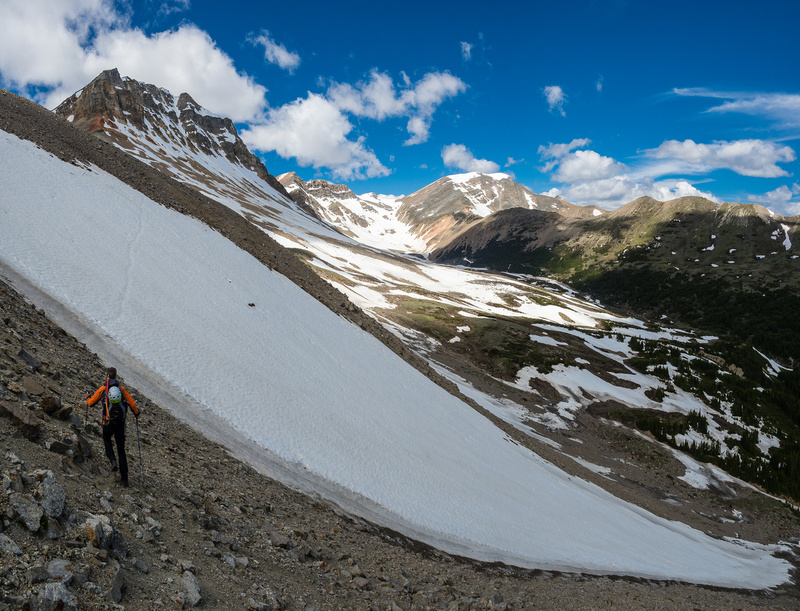 Lots of remaining snow should assist with the climb. Looking back down the north bowl at Elliot in the distance and Two O'Clock Ridge directly behind. Phil prepares for steeper snow slopes ahead. 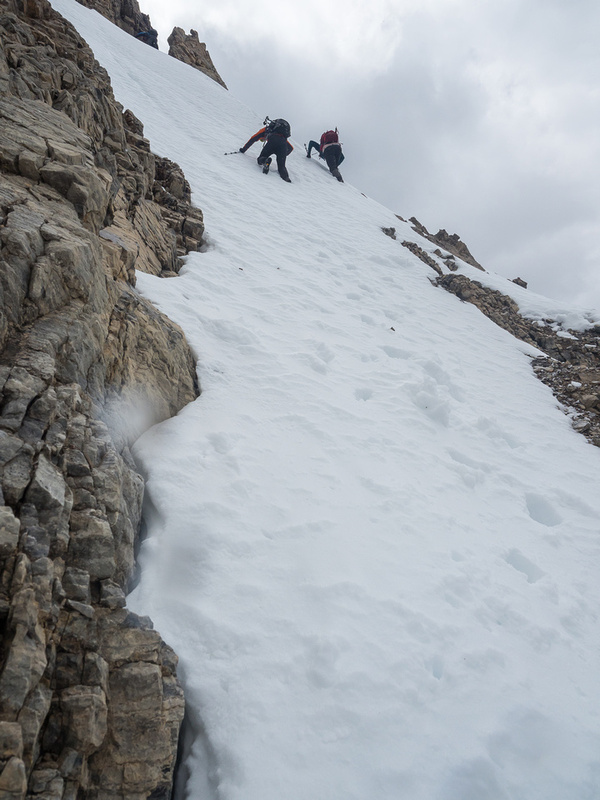 I follow Phil and Geoff up crusty snow to the upper summit block. Robin was happy to get some practice on steep snow. Two O'Clock Peak at left here. This is looking north over Landslide Lake (L), Landslide Peak (C) and Two O'Clock Peak. Elliot at far right. Robin wasn't sure she'd continue but when I told her I was getting some awesome shots of her ascending the snow, she decided to try a bit further. Now we're cooking with gasoline! 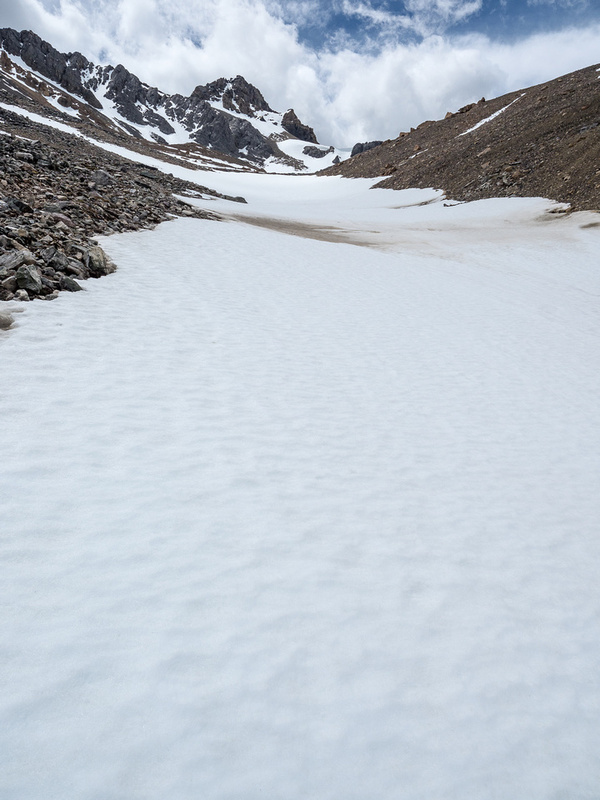 This shallow snow arete was around 40-45 degrees. Trying to punch a route through the summit block. According to my GPS we're already on the dang summit here! Geoff hangs out while we decide how many risks we're willing to take. I tried negotiating this terrain but it simply wasn't worth the risks. The snow had ice underneath and the loose rock beyond it was very exposed. Landslide and Two O'Clock Peaks at center with Elliot just right of center in the distance and Two O'Clock Ridge running in front of it. Weather is coming in from the west over Landslide Lake. 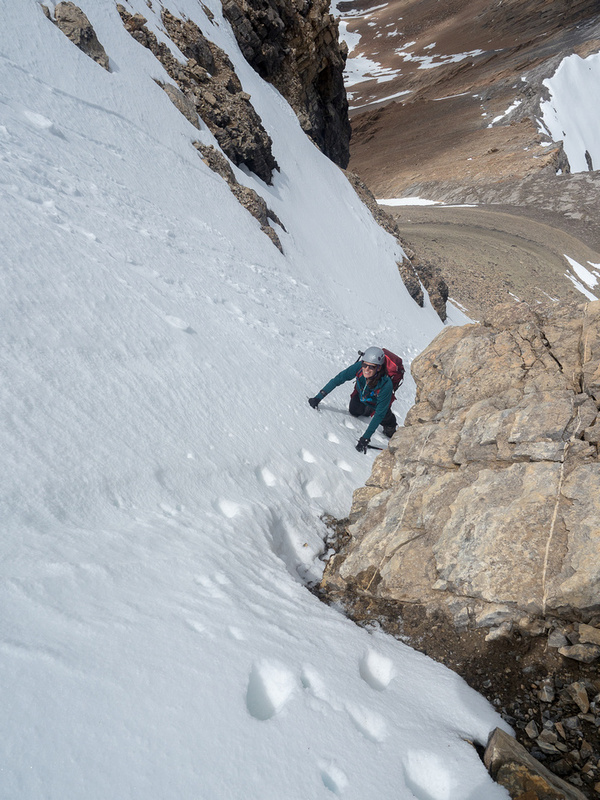 Carefully downclimbing the steep snow slope - remember that nobody else has crampons. I love this shot of Robin and Phil downclimbing the steep snow with Landslide Lake and Peak in the background. "Whirly Puff" has a cairn on top, so naturally we bagged it. It's the highest point between Tuff Puff and Whirlpool - hence the creative name. 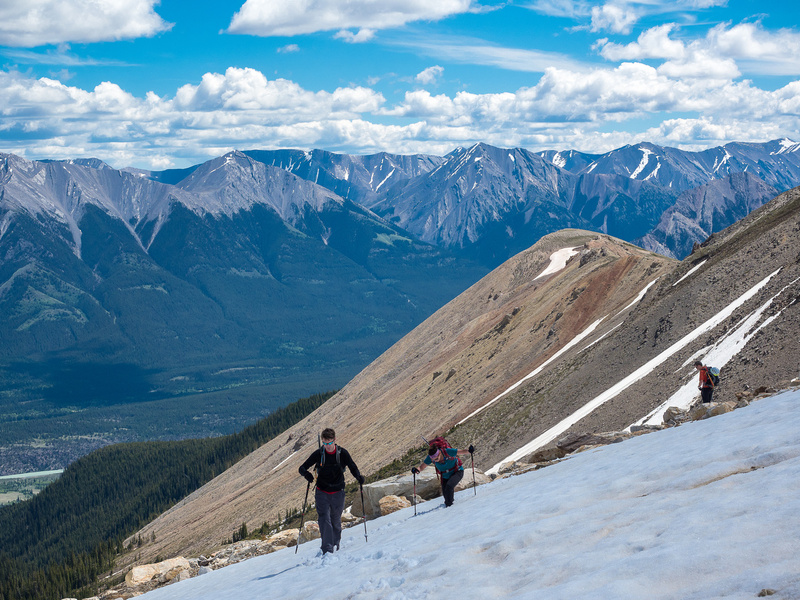 We gave the east aspect of Whirlpool's summit an honest effort, but the sun baked snow was very loose (obviously) and it didn't feel safe to be on it this late in the day. Looking back up the north bowl. 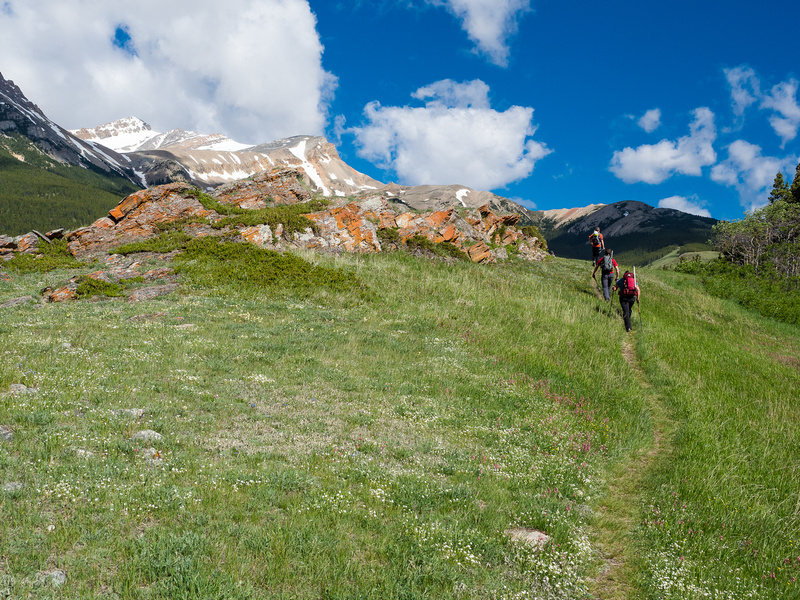 Rather than side-hill on return, we descended right to the Two O'Clock Creek valley and trended out to Tuff Puff before re-ascending it. Nice flat terrain for once! William Booth in the distance. 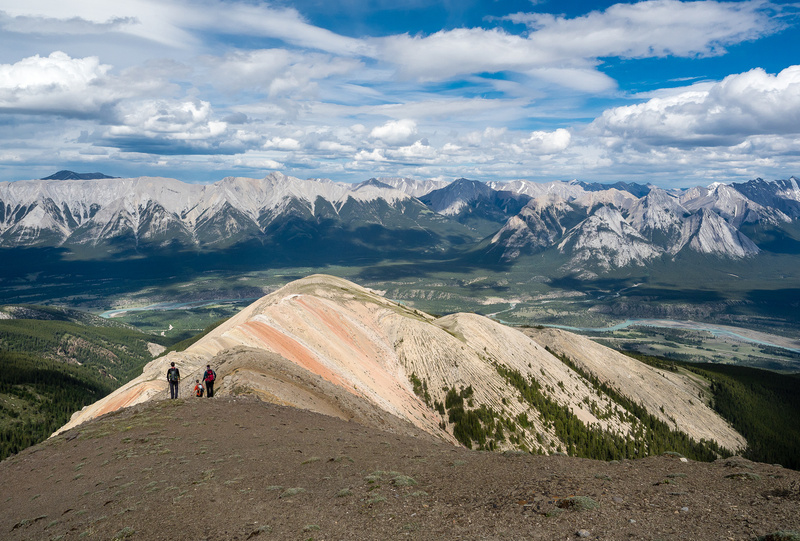 Our entire descent ridge from Tuff Puff stretches out and curls to the right with great views beyond. Easy scrambling towards Tuff Puff. 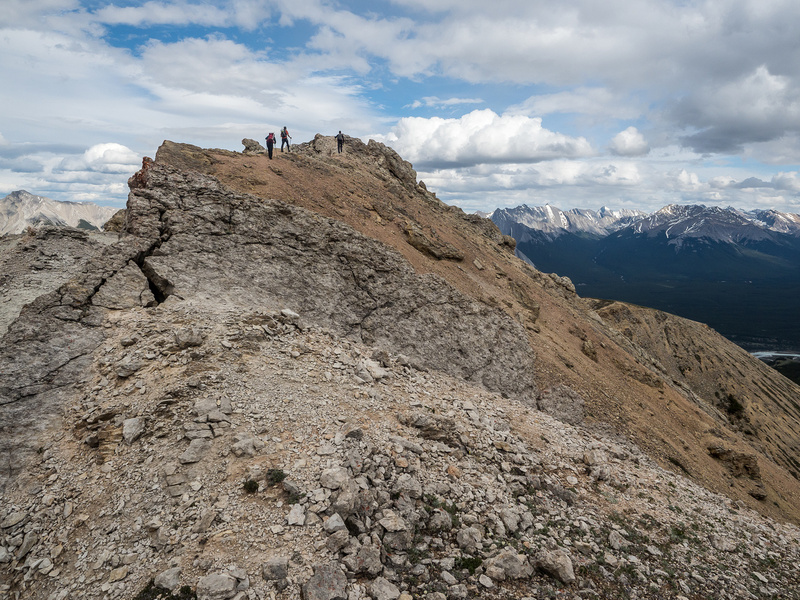 If you hike Tuff Puff, you should continue a ways up the ridge beyond for more fun and even better views. 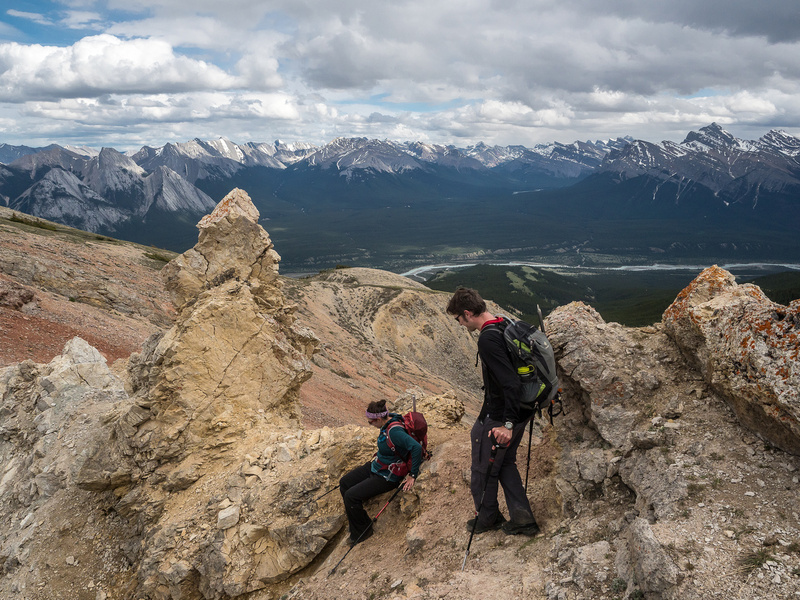 A short scrambly step on the ridge. Geoff leaps from the obstacle! Looking back up at Tuff Puff as Robin descends the trail. Back in the land of green grass and wildflowers.